German mobility provider Sono Motors today announced its partnership with Bosch. The technology and service company will provide the Sion's central control unit and a software-based solution for its intelligent networking. 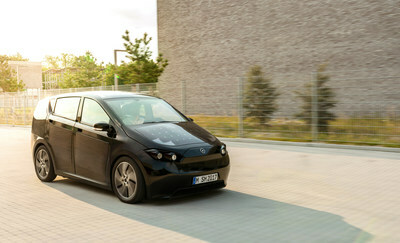 The electric car with solar integration - the first ever to go into series production - has been designed with maximum efficiency for the user, offering car, ride, and power sharing. The Sion's data connection with the cloud will be managed by a connectivity control unit (CCU) from the leading automotive supplier and by the Bosch Automotive Cloud Suite, which will also support a number of functions in the goSono app from Sono Motors. Cloud connectivity will also act as a basis for digital mobility services, such as charging electric cars and the eCall automated emergency call function. "The mobility of the future must be devised in such a way that it is more climate and resource preserving and be considerably more efficient than it has been so far," says Roberto Diesel, Chief Technology Officer at Sono Motors. He adds, "Private vehicles remain unused for 23 hours per day on average. They worsen the problems of limited inner-city parking space and are often used by one person alone. The integrated mobility functions are therefore a core part of our car concept." This concept is based on the idea of making the vehicle accessible to as many users as possible. An intuitive mobile application integrating all the mobility services will allow users to share rides, energy, or even the car itself. Besides addressing environmental and climate protection, the company tackles the problems of an overburdened infrastructure, which will ultimately only be solved by a reduction in and the significantly higher utilization of produced vehicles. This offering of mobility-related services forms the second pillar of Sono Motors' business model, alongside car development and manufacturing as the first. Sono Motors recently announced Continental as the supplier of the Sion's electric drive system and ElringKlinger as its partner for battery development and production. The company has so far received around 9,300 partially paid preorders for the Sion. Production is scheduled to commence at the end of 2019. What started out as the garage project of two friends and the vision of a sustainable mobility concept independent of fossil energy sources became the innovative and owner-managed automotive company Sono Motors in 2016. The company now boasts an experienced team of engineers, designers, technicians, and industry experts who are developing and building a forward-looking electric car suitable for daily use, with integrated solar cells and innovative mobility services. The carbon emissions that cannot be prevented or reduced during the vehicle's production and manufacturing are entirely offset. The first prototypes were produced in 2017 with the support of renowned investors and crowdfunding, and have since been driven and experienced by more than 13,000 potential customers at test drive roadshows. The overwhelming response to the vehicle and mobility concept confirmed the company founders' vision and is turning it into a reality - the Sion electric car will go into series production at the end of 2019.